A US film maker, Amy Horowitz, went out onto the streets of Minneapolis to speak to young Muslims and found that most of those questioned would rather live in the Muslim countries they came from and under Sharia law than in the US. The majority of the people answered that they’d rather live under strict Sharia law. Sharia law gives women virtually no rights at all, they can be married at the age of nine, and is a literal interpretation of the Quran, which governs all aspect of life. Horowitz then asked Muslims in a predominately Somali area of Minneapolis if they would rather live in the US or Somalia. Somalia, which has been engulfed in civil war for three decades, is one of the poorest countries in the world.Yet most of the Somalians Horowitz spoke to said they would prefer to live there than in the US, except for one young boy who said he wanted to live in Saudi Arabia. 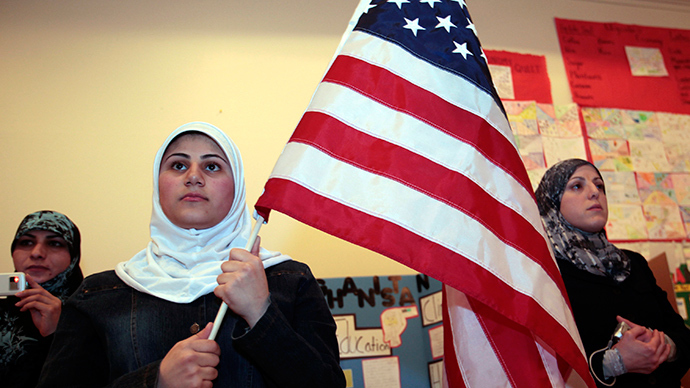 Horowitz believes that many young Muslims he spoke to answered the way they did because they feel alienated from US society, despite being born or growing up in the US. “What we find among the Muslim immigrants in Europe and the United States is that the first and second generation are more radical than their parents, they’re not integrating as time goes by and there’s a larger alienation,” he told RT. One young Somalian wearing a baseball cap and speaking fluently in a strong American accent said he did not feel American. “I speak fluent [English] and I can articulate what I’m trying to say, but other than that, as far as my culture and my preferences and everything I’m still Somali,” he said. Horowitz explained that it is this generation of immigrants that has become problematic to Western countries. “The fact that the vast majority of young people I asked would rather live in Somalia or Saudi Arabia as opposed to the United States, it blew me away,” he said.